A Mobile Masterpiece of Class... Durability and Comfort The Blue Streak Wheelchair with Flip Back Desk Arms from Drive Medical represents a new class of leading-edge mobility enhanced wheelchairs that have been engineered and structured, to not only meet, but exceed the growing demands and expectations of users who cherish independence, mobility and comfort.It arrives at your door loaded with features designed to enable and enhance your mobility and comfort. Arm rests are fully padded. The frame, black cross brace and the nylon upholstery is durable, attractive and easy to clean.The tires which are made of solid rubber, give you an enormous amount of durability. 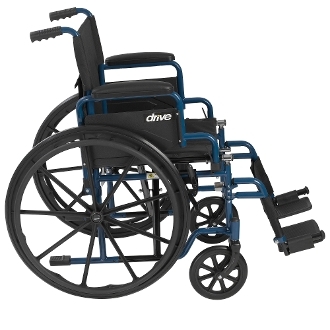 If that wasn't enough, this leading edge mobility aid also requires little to no maintenance.Users also appreciate that The Blue Streak Wheelchair comes with easy to operate push to lock brakes, along with convenient swing away footrests with plastic footplates that allow you the user, too safely, effortlessly and with convenience, slide in and out of your chair.You'll also appreciate the padded desk arms which furnish you with unbeatable comfort, allowing you to slide up as close as you desire, and need to be to tables, and or desks. Go ahead...Experience the Drive Difference Now!